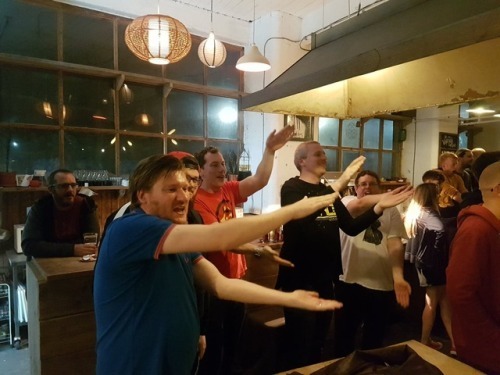 Graps and Claps Reviews – TIDAL Wrestling ‘FLABBERGASTED’! Hello and welcome everyone to another edition of Graps and Claps taking me this time on a midweek journey to Leeds for Tidal Wrestling’s Flabbergasted where the premise of the show’s matches were all a bit of a mystery apart from one mixed tag team match where the combatants had been announced. Taking the packed 4:36 pm service from Rochdale, I tucked into my reduced priced scotch eggs and a can of Co-Op lager to pass the time along, before I arrived into Leeds for 6 pm, to meet up with Graps and Claps columnist’s Ben and Chris at Tapped to walk up to the venue, but not before I sampled a pint at North Bar along the way. This time going for a £6 pint of North Transmission IPA which is along the fruity side of the IPA line, certainly a good drink to try if you are ever visiting any of there outlets of which there are many in Leeds. Arriving at the Temple of Boom for 645 pm we took our places in the venue to the left hand side of the entrance with a perfect view of the Vegan Curry and Rice cooking away in the kitchen as temptation of what was to come for tea tonight. 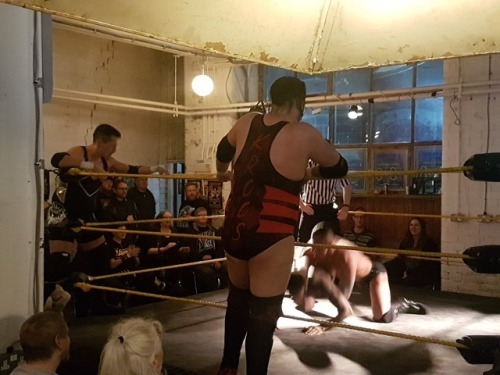 A healthy crowd of just over the 100 marker packed the Vegan Cafe once again as it has done in the last few months to take in a 7-match card, so let’s get into what went down! This is where the action took a wild and chaotic turn for the best as Kayman was hooked by a fan and then subsequently squirted with JIF Lemon and also some sweet chilli sauce by Jack Bandicoot to impair his vision around the cafe area. 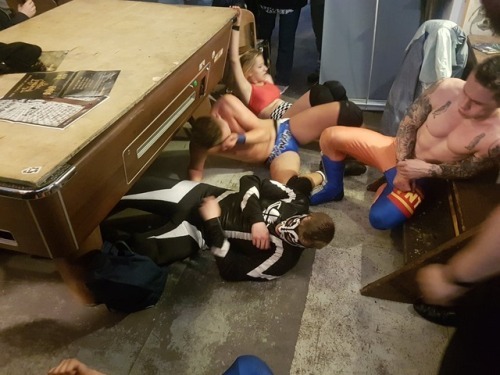 We also had Bandicoot climb to the balcony to hit a dive to everyone on the floor, just missing the pool table by inches, said pool table also had both Kayman and Sykes fighting on it while Arcadian on the other side of the room hit a double ddt to both members of Crashboat. With Arcadian seemingly on top he took Bandicoot to the top of the bar looking to hit a Canadian Destroyer with punters looking on in horror as they got very close to the curry and rice ‘NO NOT THE CURRY!’ unfortunately for Arcadian he was unable to hit this move and was instead hit with a code red of sorts from Bandicoot to get the 3 count to end an excellent opener – props go to all 5 of these young wrestlers for their effort!! If I had to choose one to take out of this match it would be Jack Bandicoot who has certainly got a bit of the Rockstar Spud’s about him. 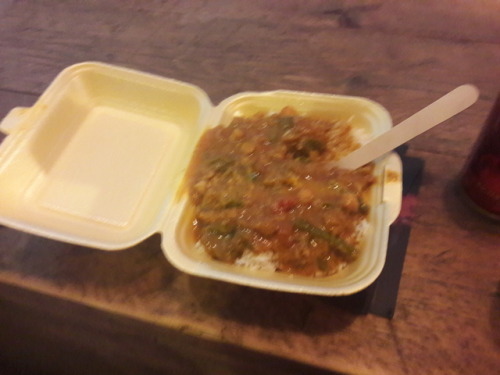 Before the next match I got my Vegan Curry and Rice for £5 and as it was fantastic filling a very much needed hole in my tummy. Next up was for the TCW Open Championship with the ever impressive Champion and No.1 Graham Chapman lookalike Brady Phillips taking on Joe Nelson who as the audience pointed out – he has just got an E in French instead of the predicted A in said subject. This was a match based around Nelson trying to use his speed and agility against the much bigger Phillips who has thankfully ditched them bloody awful white jeans he was wearing at the last show. Early on Phillips hit a hard clothesline to Nelson for two count before chucking Nelson to the outside, only for Brady to try and hit a dive which he took a heavy fall hitting the hard wooden chairs on the outside. With Phillips hampered, back in the ring Nelson hit a code red for a two count and then he tried to follow up by going up top but he was straddled on the top rope by Phillips who hit an elevated DDT to end a spirited effort by Nelson to retain his TCW Open Championship in another entertaining match. Both these lads have something special, keep a look out for Brady Phillips on your radar! 3rd match was a Women’s contest with Rhio who is currently the No.1 contender to the Tidal Women’s Championship taking on WWE Mae Young Classic competitor Xia Brookside who was replacing Shax in this contest. In what was a back and forth contest, Xia tried to submit Rhio with a modified stretch surfboard with Rhio being clasped in it for well over a minute, Xia though let Rhio go and went to finish it off with a forward roll slam from the top but was batted off by Rhio who grabbed a denim jacket to choke Xia with the blinkered referee watching on – bad officiating, with Xia dazed it left Rhio to finish off Xia with a Pumphandle Slam to get the 3 count Whilst this was a fine match, I thought this a good showcase for Rhio and she proved more than Xia’s equal and maybe even better than Xia herself. Half time Main Event action next with a 6-man tag with Fraser Thomas, Sean Kustom and the Lincoln Leviathan Will Kroos taking on the TCW Tag Team Champions The Lion Kings and the debuting Man Like Dereiss. Early stages of this match was based around Thomas, Kustom and Kroos working over the youngster Dereiss to great effect, but Dereiss thankfully got the tag to Nsereko who even it up for the goodies in this match. The exchanges as well during this match between Sebb Strife and Will Kroos had me purring for a future contest between these two big lads – hard hitting are certainly the words to describe this. With Thomas, Kustom and the Lion Kings sent to the outside, back in the ring it was Kroos who finished off Dereiss with the ‘Greetings from Sincil Bank’ to carry on his impressive record in Tidal Wrestling. I certainly wouldn’t mind seeing him vs Rampers sometime in the next year. Back from the break, we were greeted with Sean Only who was out to call out Dara Diablo for whom he lost in cheap fashion last time when Dara hit only in balls to pick up the victory. This time there was high stakes on the line, as we had a Wrestle Island Championship match for whom Only is their current champion. Early portion of this match, obviously had the Baldy Baldy chants towards Dara who it does have to be said is hairy everywhere else apart from his napper. Dara dominated a huge portion of this match working on the leg of Only who went down selling on a number of occasions but this only drew Dara into a false sense of security as Only recovered to hit a Superkick to Dara’s chin and then the final blow of a Curb Stomp to retain the Wrestle Island Title. Next up we had the only match announced properly for the night with Mixed Tag Action with Little Miss Roxxy and H.T Drake taking on El Ligero and Ruby Radley – a reet old battle of the graps couples in this one. Now the basis of this match was the pairings got changed around 3 times due to El Ligero getting fed up with every combination of tag partners that he ended up with, this did culminate in the return of Knobs vs Fannies 2 with Roxxy & Ruby taking on Ligero and H.T Drake, with the finish of everyone getting fed up of Ligero and then all piling on him to get the pinfall to end the match. Sadly it only got worse for Ligs as he was subjected to the ‘AAAAAARRRGGGHHH Walk of Shame’ – Poor Ligero! Main Event Time folks now with Soner Dursun taking on Leeds and Twitter favourite David Starr who for the first 2/3 minutes of this match was greeted with a take on the 2018 classic ‘Baby Shark’ to much frivolity from the crowd – DAVID STARR DO DO DO DO DO DO!! Pictured: It’s Baby Shark time!! With the singing out of the way we got down to action and what an excellent 15 minute match this was, Starr had hit a Cherry Mint DDT and a Han Stansen lariat to Soner only for him to kick out at two. With Starr looking to hit another rope DDT, Soner managed to sweep the knee out from under Starr which only signalled the beginning of the end for Starr as he had this worked on by a blood thirsty Soner who then locked in a half crab submission to Starr which ultimately made Starr tap out despite Nana’s efforts to push the rope closer to Dave so he could get the rope but to no avail, Great showing from both wrestlers here and credit to Soner who was excellent here as the bad guy showing glimpses of the form of 2017 that he showed in Futureshock that broke his name out on the scene. 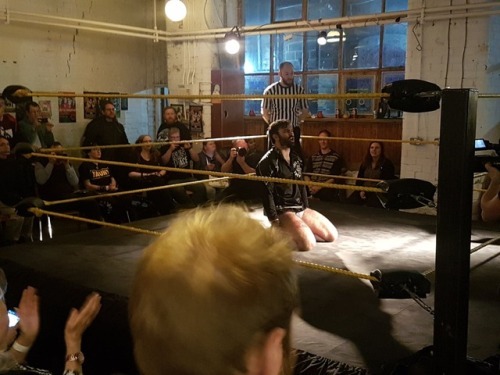 After the match, Starr got on the mic to say thank for the evening, the vegan curry and rice and also that he will now be permanently moving over to the UK to live in St.Albans for the foreseeable future which makes sense I guess due to him being over lots. So with that said it was time to leave The Temple of Boom and make our way back to Rochdale arriving back home tired and full of a cold for 12:30 am for which I am still feeling it now whilst typing this. Beer prices still £2.50 for cans of Old Speckled Hen and Budweiser and £1 for soft drinks (I can say the Mint flavoured cream soda is one to avoid). If you fancy going to see Tidal which I wholeheartedly recommend, they are on the 21st October back at the Temple for a double show and then on the 18th November for the return of Sugar Dunkerton and also Session Moth Martina (Covering for Mia Yim who has had to give up the belt) taking on Rhio for the TCW Women’s Championship. I hope you have once again enjoyed reading, as ever go give this a share and leave any comments in the usual places. Next review will be Futureshock Tapped on the 23rd September from Fairfield Social Club, so until then – BYE!